In the early 1800s, servants slept in the kitchen or in cupboards under the stairs. Later in the century, they were given the attics as bedrooms, which were cold, damp and dimly lit. Often, however, men continued to sleep downstairs to guard the plate. After 1900, steps were made toward improving the condition of servants’ rooms, mostly in an attempt to make going into service more attractive to young girls, but employers still forbade their domestic staff from displaying in their rooms any pictures or decorations, and other personal belongings. In addition, they assumed the right to search through their servants’ belongings whenever they chose. Employers were instructed - “a servant’s bedroom should have as few articles in it as are consistent with comfort”. This meant that the limited furnishings in a servant’s room might only include a simple, small wooden bed; a wooden ladder-back chair; a simple dresser; and a basic washstand. Like the servants' bedrooms, furnishings in the Servants’ Hall were simple and in ornate, as well, consisting only of the basics and essentials. 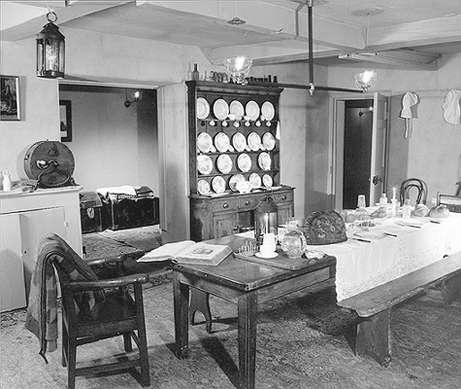 There would have been a large central table with ladder-back chairs all around, perhaps some dressers along the walls, and light was provided by candles or oil and kerosene lamps. Although most large Victorian household utilized gas lighting, it was reserved for use “Upstairs”. Of course there was a large open fire in the Servants’ Hall, which kept the domestic staff warm, if and when they found a moment to gather in front of it. The daily work of servants was strenuous and laborious, and the hours were long, but for many domestics, in spite of an exhausting workload, life was not always melancholy and woe. There were pleasures to be had at times, and there were moments of joy and contentment.One of the most common and difficult obstacles for servants to overcome was the loneliness and isolation they felt. For most servants, “social life below stairs” was restricted to contact only with one or two fellow servants, or possibly extended to include a couple of delivery men who came to the house on a regular weekly basis. Despite the often boring and frequently frustrating nature of their positions, most servants took pride in their work, and provided efficient and skilful services to their employers. Still, their work was monotonous, and most often, thankless. Because of this, any type of entertainment, leisure activities, or time off was greatly appreciated by the staff. In the earlier part of the century, servants were given no regular time off, but had to ask permission for even short periods of personal time, which of course, was typically frowned upon by their employers. Sometimes time off was given as a reward for good work done, but could just as easily be taken away as punishment. By the 1880s, servants were given a half-day off on Sundays, starting after lunch (and only if all their chores for that morning had been completed), and they were usually given one day off each month, starting after breakfast, and again, their chores all had to be finished first. By about 1900, an evening a week was added for many servants, but this took place more often in households with more than one servant so that they could “cover” for each other. By the 1890s, servants also received one week’s holiday per year (in later years this increased to two weeks), and because home-sickness and loneliness were so prevalent among servants, many tried to save up all year long in order to afford the train fare home during this break. The cost of travel meant that many servants might not see their friends and families for several months or even years! In many households there was a strict rule against servants having visitors, but in most cases, callers continued to make covert visits, especially when the master or mistress was not at home. Indeed, when “no one was looking” there existed, especially in larger houses, a special pleasure below stairs known as “The High Life”. This was the time when servants (especially the male staff) played cards, (and sometimes even, when their bookmakers visited). This was the time when the domestic staff had pillow fights; when there was laughter; when there was music, fiddling, piano-playing, dancing and singing; when some servants got drunk; when some played practical jokes on each other, and some flirted with each other—and when some even went as far as to “cohabitate” with each other. ever-strict requirement that they be back on duty at 9 or 10 o’clock p.m. frequently cut their leisure time short, and because employers enforced a “no followers” rule, female employees always had to meet their boyfriends secretly. Naturally there were cases, especially in larger households, when unions were made between female and male staff members. Should the relationship have become known, however, one or both of the employees would have been dismissed. Granted, there are documented exceptions to this rule, sometimes with the servants even gaining the approval and encouragement of their employers, but for the most part, breaking the “no followers rule” generally carried severe penalties for domestics, especially when the rule was broken with fellow employees. A great majority of female domestic servants did get married, of course. On the average, they were about 25 years old when they married. By the time of marriage, they had, on average, been in service for some twelve years, and had been placed in between three to five situations. Once they married, however, girls who had been in domestic service found few ways in which to earn money. They could not go back to their jobs as live-in servants, because they were married, and were now expected to care for their husband and children. Attitudes regarding domestic service began changing toward the end of the 19th century, but even by 1911, domestic service was still considered the largest employer for women and girls. 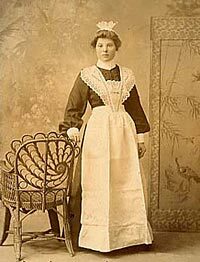 There were, of course, by far fewer servants in proportion to families in the 1900s than there had been in the 1880s. Specific tasks were carried out, as defined by the strict, yet necessary daily routines of each staff member. Each individual position carried its own list of expectations, which the servant was required to meet. 1 - When being spoken to, stand still, keeping your hands quiet, and always look at the person speaking. 2 - Never let your voice be heard by the ladies and gentlemen of the household, unless they have spoken directly to you a question or statement which requires a response, at which time, speak as little as possible. 3 - In the presence of your mistress, never speak to another servant or person of your own rank, or to a child, unless only for necessity, and then as little as possible and as quietly as possible. 4 - Never begin to talk to the ladies or gentlemen, unless to deliver a message or to ask a necessary question, and then, do it in as few words as possible. 5 - Whenever possible, items that have been dropped, such as spectacles or handkerchiefs, and other small items, should be returned to their owners on a salver. 6 - Always respond when you have received an order, and always use the proper address: “Sir”, “Ma’am”, “Miss” or “Mrs,” as the case may be. 7 - Never offer your opinion to your employer. 8 - Always “give room”: that is, if you encounter one of your betters in the house or on the stairs, you are to make yourself as invisible as possible, turning yourself toward the wall and averting your eyes. 9 - Except in reply to a salutation offered, never say “good morning” or “good night” to your employer. 10 - If you are required to walk with a lady or gentleman in order to carry packages, or for any other reason, always keep a few paces back. 11 - You are expected to be punctual to your place at mealtime. 12 - You shall not receive any Relative, Visitor or Friend into the house, nor shall you introduce any person into the Servant’s Hall, without the consent of the Butler or Housekeeper. 13 - Followers are strictly forbidden. Any member of the female staff who is found to be fraternizing shall be immediately dismissed. 14 - Expect that any breakages or damages in the house shall be deducted from your wages. In Victorian times, live-in servants, who had all their expenses (food, lodging, clothes etc) taken care of, earned as little as £10 a year, (which is only the equivalent of £77 in today's money). Here is a list of the average wages of servants (figures collected by the Board of Trade in the 1890s). In 1888 Butlers earned £45 per annum and had no expenses except clothes. They would make up their income from such perks as tradesman offering discounts to receive continued orders. Butlers would also collect the end of candles and one bottle of wine for every six opened. Servants descriptions and selected images copyright © 2004-2008 The Webmaster of Our Ward Family Web Site (Peter Ward). All rights reserved.